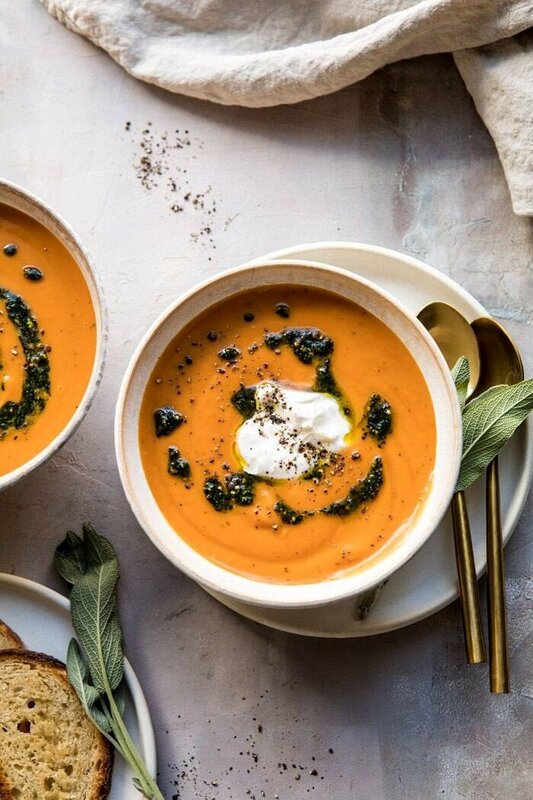 Cold nights are made better with this Golden Sweet Potato Soup with Burrata and Sage Pesto. Fall sweet potatoes pureed with caramelized shallots, fresh thyme, a touch of butter, and creamy coconut milk. 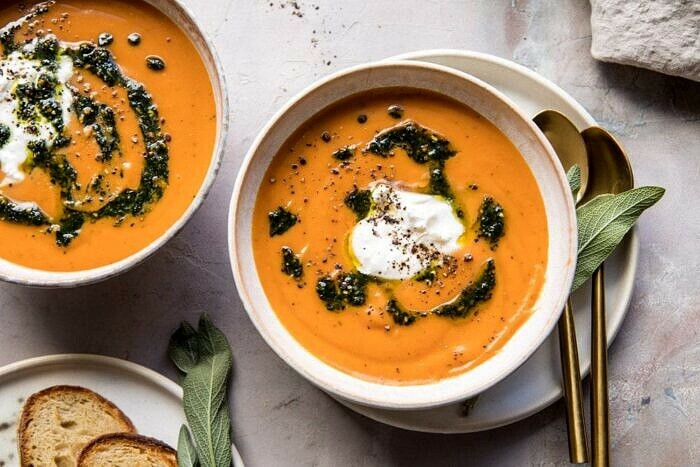 Each bowl is swirled with fried sage pesto and topped with creamy burrata cheese to create the perfect savory bowl of sweet potato soup that’s warming and so delicious. This is a mix of healthy and indulgent…and there’s nothing not to love. Serve this as an easy dinner, or as part of this year’s Thanksgiving menu. This has been the month of soup here on HBH. As you guys know we’ve had some seriously chilly weather here in Colorado. It’s left me wanting nothing but warm bowls of soup and giant mugs of sweet hot chocolate. Once it starts to snow here, pretty much all I want is soup, warm bread, and hot chocolate. My mom taught me well.. Speaking of which, both my mom and little sister have entered full on Christmas mode. And while I’m not quite there yet, I do have to say, I love their spirit, and am so excited! I ordered them a couple of “pre-Christmas” gifts which I gave them on Saturday. It was just a couple of candles and cute ornaments. But it was fun to take twenty minutes and just hang with them. It’s been so hectic with work that I barely have a minute to breath. But sometimes you just have to stop and take a minute, even in the busiest of times. This is easier for me to say than do, but I’m slowly trying to learn. Baby steps right? Anyway, before we talk Christmas, Thanksgiving needs to happen first. We’re only about a week and a half away and the excitement is definitely building. Today I’m continuing the Thanksgiving recipes with this creamy soup that doubles as an easy dinner, or a first course to your holiday meal. Sweet potatoes are one of my favorite fall vegetables. They feel incredibly indulgent, but they’re actually one of the healthiest vegetables. 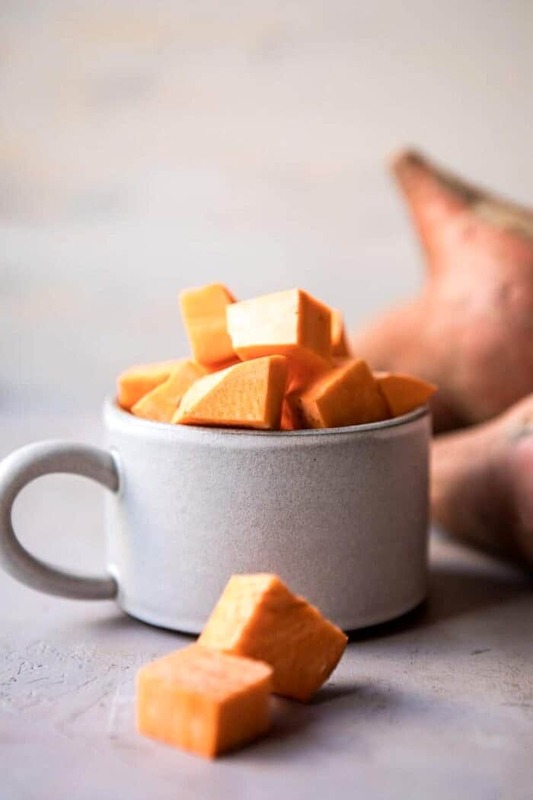 I know everyone always thinks sweet potato casserole or sweet potatoes fries, and while I love both, I also love using sweet potatoes in soup. 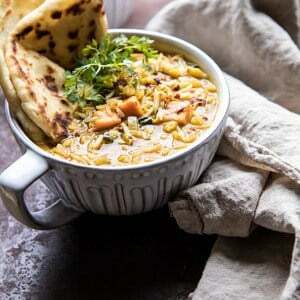 Most recently I made this sweet potato lentil soup with rice that has become a reader favorite. I’ve wanted to create a creamy sweet potato soup for a while now, so I figured this was the year. 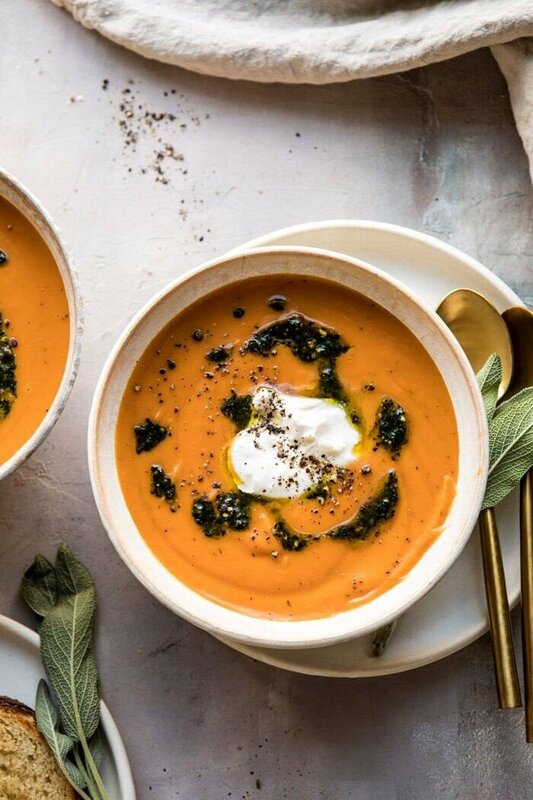 Enter this creamy sweet potato soup, swirled with sage pesto and topped with burrata cheese. And yes, I put burrata cheese on the soup. Would you expect anything less from me? I hope not, I love soup, and a love burrata, so it had to happen. I wanted to keep this soup creamy, savory, and cheesy. The base is a pretty simple mix of caramelized shallots, thyme, sweet potatoes, and creamy coconut milk. I love using coconut milk in place of cream as a healthier, creamier option. You really can’t taste the coconut, but the creaminess is all there. The major flavor comes from the sage pesto. It’s hands down, one of my favorite pesto. So much flavor. 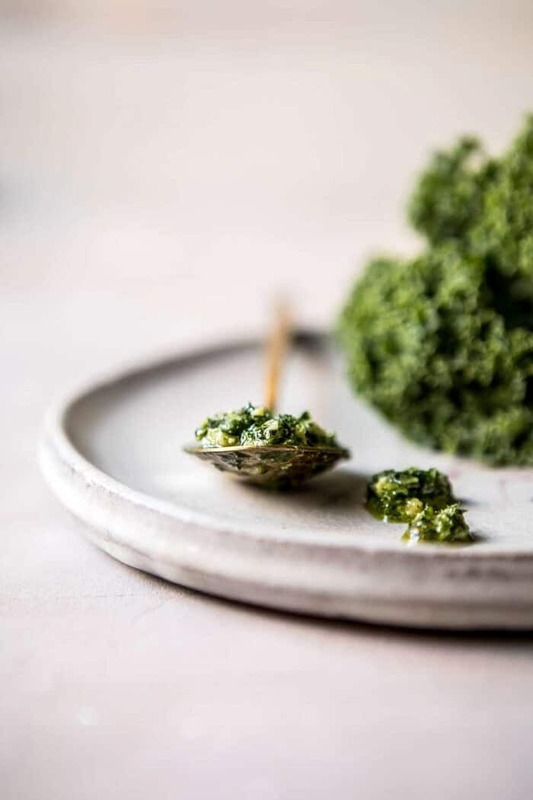 To make the pesto, just pan-fry a good amount of fresh sage in a little olive oil and then combine it with the kale (mostly for good color and heft, you don’t taste it). Then add salty roasted pistachios, parmesan cheese, and crushed red pepper. It’s the perfect fall pesto, and a really fun switch up from traditional basil pesto. The pesto is both swirled into the soup and served on top. The more pesto the better, if you ask me! About the burrata, some might find it unnecessary to add. But you guys know me. You know that I’ll tell you the burrata absolutely is necessary. It’s the perfect creamy cheese to go atop this sweet and savory soup. It will take your soup to a new and delicious level. Trust me here…burrata + soup = game changer. As mentioned, this soup is equally great as a light dinner or a sweet first course to this year’s Thanksgiving. Whatever you decide, just be sure to make this soup soon. It’s one you’ll be making over and over again! If you make this sweet potato soup please be sure to leave a comment and/or give this recipe a rating! Above all, I love to hear from you guys and always do my best to respond to each and every comment. And of course, if you do make this recipe, don’t forget to also tag me on Instagram! Looking through the photos of recipes you all have made is my favorite! Cold nights are made better with this Golden Sweet Potato Soup. 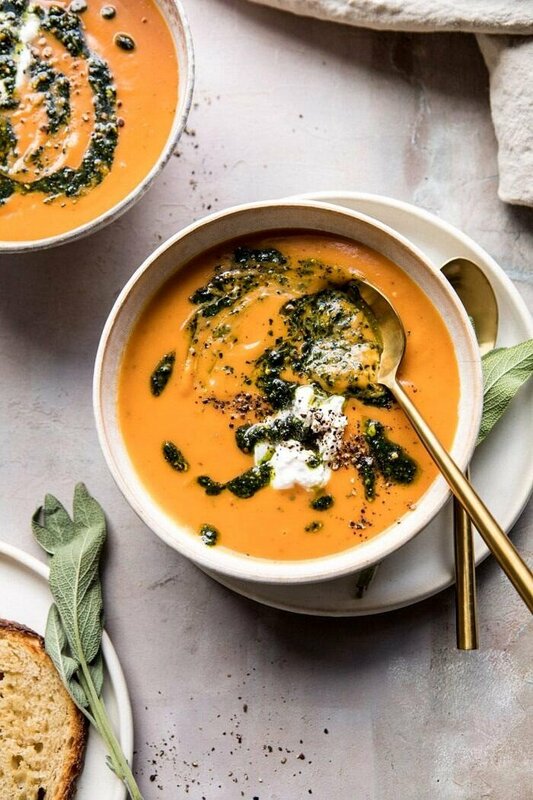 Each bowl is swirled with fried sage pesto and topped with creamy burrata cheese to create the perfect savory bowl of soup that's warming and so delicious. 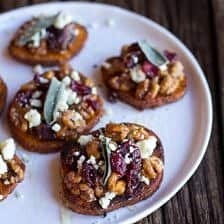 A mix of healthy and indulgent, serve as an easy dinner or as part of this year's Thanksgiving menu! 1. To make the pesto. Heart 2 tablespoons olive oil in a large skillet over medium heat. When the oil shimmers, add the sage and cook 2 minutes, until fragrant and crisp. Remove from heat. 2. In food processor, pulse together the remaining 1/3 cup olive oil, kale, pistachios, and parmesan until finely chopped. Add the sage and season to taste with salt and crushed red pepper flakes, pulse to combine. 3. Make the soup. Heat the olive oil in a large pot over medium heat. When the oil shimmers, add the shallots and cook until soft, about 5 minutes. Add the thyme and butter, cook another 30 seconds. Pour in the broth. Add the sweet potatoes, cayenne, nutmeg, and a pinch each of salt and pepper. Bring the soup to a boil over medium-high heat and then reduce the heat to medium-low. Cover and simmer for 15 to 20 minutes, until the potatoes are fork-tender. 5. Using an immersion blender, blend the soup directly in the pot until smooth. Stir in the coconut milk and 2 tablespoons sage pesto, cook another 5 minutes. If the soup is thick, thin with addition broth. 6. To serve, ladle the soup into bowls. Swirl each bowl of soup with pesto. Break the burrata and spoon some over top the soup. Enjoy! Just want to say how much I loooooove the titles of your recipes!!! They entice me every time! Every year, I buy a template off of Etsy to print my Thanksgiving menu. I have you to thank for how I write the descriptions of each appetizer, main entree, side dishes and desserts. And Iove how delighted my guests get when they read the menu for the first time. You are an inspiration in so many ways :-). Thank you for the love and care and attention you put into your work! Hi Jeannine! I am so glad you appreciate the work I put into my blog and you’re enjoying the recipes I share! Thank you so much! I’ve said it before and I’ll say it again – you had me at burrata! Haha I am so glad to hear that! I hope you try this Rebecca! This soup looks so tempting. I am definitely trying this soon. I absolutely love your recipes! How you incorporate so many fresh herbs, commonly available ingredients (well except Burrata, I still can’t find that where I live in northern BC), the use of seasonal veggies, and the way the food is displayed for such visual appeal, it just makes me want to try each and everyday’s feature recipe. I have passed your website on to every person I know who likes to try new and different approaches to cooking. The only one thing that has been mentioned to me is that there are times that you don’t use measurements and for inexperienced cooks this can be a bit daunting. A friend called the other day and asked just how much half a sweet onion would be as the one she had in her hand was the size of a grapefruit. In some recipes it wouldn’t matter all that much but in others the onion flavour may be too much. Aside from that, I can’t wait to try today’s soup especially as my sage plant is enormous and could use a wee trimming. Hi Barbara! I am so glad you love my recipes! That is a great idea to add in more information, so I will look into that. Thank you! I’m probably the only reader who is eve going to thank you for publishing a pesto recipe without garlic. People who can’t digest garlic are few, but we are out there and we miss pesto! I’ve also got a bunch of sage from my CSA in the fridge, so I am definitely going to make this! Thank you Molly! I hope you love this! Is there a substitute for Burrata?? I can’t find Burrata cheese. What can I use instead? Thanks for your help! This sounds delicious! I will be making this soup soon! I just made this. Delicious!! I love all of these flavors. I did put more than pinch of cayenne just because I like a little more spicy when working with sweet potatoes. Thank you for delicious food as always! Thank you so much Michelle! I am so glad this turned out so well for you! Thank you so much Kamille! Haha I am glad you caught that, but it is nice! Haha it is really good! I hope you try this, Rachel! This is my kind of soup! I love the burrata and pesto, can’t wait to try this! Do you think we would be fine using pine nuts or almonds instead of pistachios? Nothing against pistachios just not feeling like going to the store to buy some! If made the day before, at which step would you stop? Hi Hannah! It is a hand held blender that goes into the pot. I will leave a link below if you would like to see it! Oh my! This soup is WONDERFUL! I like the burrata in it, but for those who can’t find it, it’s scrumptious without. Thursday night dinner win! I am so glad you still loved this recipe, Gina! Thank you! Just made this and it is a hit with the whole family 1yr too 🙂 For the pesto I subbed parsley for the kale and walnuts for the nuts. It is really good thanks so much. Oh also we don’t do dairy so I used Trader Joe’s cultured vegan butter and left off the cheese to top it and it definitely didn’t taste like it was missing anything. Oh also for anyone wondering I used homemade Parmesan for the pesto. Ok thanks. Happy Thanksgiving. Hi Tammy! I am so glad you loved this recipe and it turned out so well for you! Thank you so much! Just finished making this soup. It is delicious! Thanks for posting such lovely recipes. Hi Denise! I am so glad you loved this soup! Thank you so much! This soup looks fabulous! Can it be made in a slow cooker? I served this soup as a first course for our family Thanksgiving. It was velvety smooth, flavorful and looked beautiful! I also made the Chai Pumpkin cake and I was the Thanksgiving hero. You are mine because you never let me down! Thank you! Awh that is so sweet! I am so glad you loved this recipe and others on my site! Thank you! 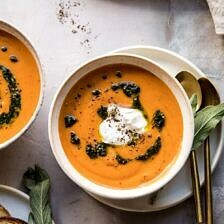 This recipe creates a wonderful sweet potato soup for those of us who prefer savory over sweet. Even without the burrata and sage pesto, the flavors are subtle, balanced and soothing with the cayenne adding the perfect amount of heat. 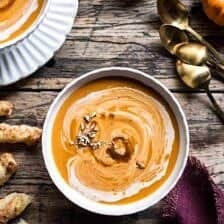 This special recipe has become one of my favorite sweet potato soups and was a hit among my Thanksgiving guests. Thanks so much! Thank you Cathy! I am so glad you loved this recipe and it turned out so amazing for you! 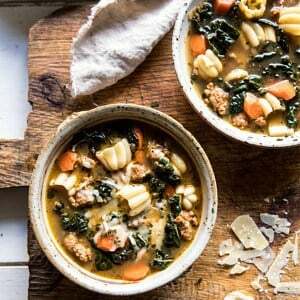 I really want to try this soup – it looks amazing! But I don’t have an immersion blender. I do have a stand-up blender though. Any suggestions on how to rework the recipe to use what I have? It’s hard to find burrata in my area so we had to do without but it was still SO delicious! And I think this soup pairs amazingly well with Smitten Kitchen’a broccoli melts! Such a delicious dinner. Thank you Renee! I am so glad you loved this! The soup is really nice-very simple to make. But the pesto is what brings it to perfection. It is SO delicious and doesn’t taste like every other pesto you have ever had. It has a nice sage-y flavor and you can really get the pistachio out of it. I, for the life of me, could not find burrata anywhere but I am sure it would have brought it over the top-next time I will get ricotta or fresh mozz to put in it as a substitute. This is the kind of recipe where the soup is nice on its own but it benefits from the whole recipe being together with the pesto. Dont skip it! Thank you so much Andrea! I am so glad you loved this recipe!